maple and shade: THE BEFORE. And all because we finally got the internet company over to our new house. Who knew it took so long to get your appointment setup?! Anyhow...I know you thought I'd left you. I didn't. I've been swallowed by this new house...as busy as I've ever been trying to juggle work, moving, unpacking, painting, cleaning, finding furniture, deciding on decor, planting a garden before it gets hot, getting all the workers over to our house that need to do things...and...we've had company in town. But it's fun. And amazing. And wonderful. I was so over living in tiny little apartments in other people's leftover filth (those old spaces with so much "character" just never really feel entirely clean). So here we are, in our very own house, doing our very own things, our very own way. It's slow-going, considering how busy we are. 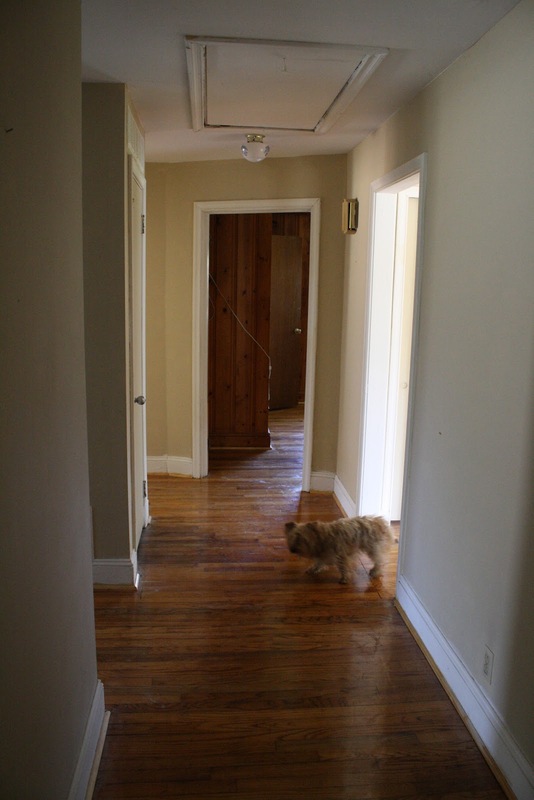 Maple and I both thought each project would go pretty quickly and smoothly. We're quickly realizing that's not the case. But that's okay--it's a work-in-progress, and I'm so excited to keep you updated with all the projects and ideas we have swirling around in our heads. Try to ignore that dark line etched into the gleaming hardwoods. Yes, it winds through the house and leads you all the way to the kitchen. So, that means some brilliant someone dragged a fridge through the house? Or maybe a keg? I mean, Frat House LLC did at one point own our place. Yes, that is real...and I am thankful for the invention of rugs. So, the entry/livingroom/dining room are essentially one big L-shaped space. This is the angle you see on your right as you make your way through the front door. Those apartment blinds were my worst nightmare (and the first thing to go), but that picture window is pretty much my dream. Looking back toward the entryway and the bedroom wing of the house. See that upside down sconce the precious owner hung right against the crown molding? Nice. Also...gone. I didn't love how these rooms flowed together at first. I've decided I like boundaries, I guess. But this was only the second house we saw, so the more we checked off the list, the higher this one rose in stature. So, I have a solution. See that huge, bare wall on the right? Well, we're doing a built-in bench on it. Maple and I bought a huge barn door that's in really great shape, so we're in the process of making a base for it to serve as our dining table. That means no decisions will have to be made about how to walk around a table. It will be a cozy eating nook butted against the wall, giving me plenty of room for a sideboard on the opposite wall. Huge. Awesome. Amazing. Glorious. I obviously love it. Just look at that huge picture window. There are actually three more of them in here (not quite that big, but still...). Just look at that tile--it's beautiful, rustic terra-cotta (I'm super picky about tile). Just look at those cabinets that extend all the way to the ceiling. They are simple, but I love them. And, there are two walls of cabinets. TWO. And room for our butcherblock as an island (which I am sitting at now with my coffee in hand). 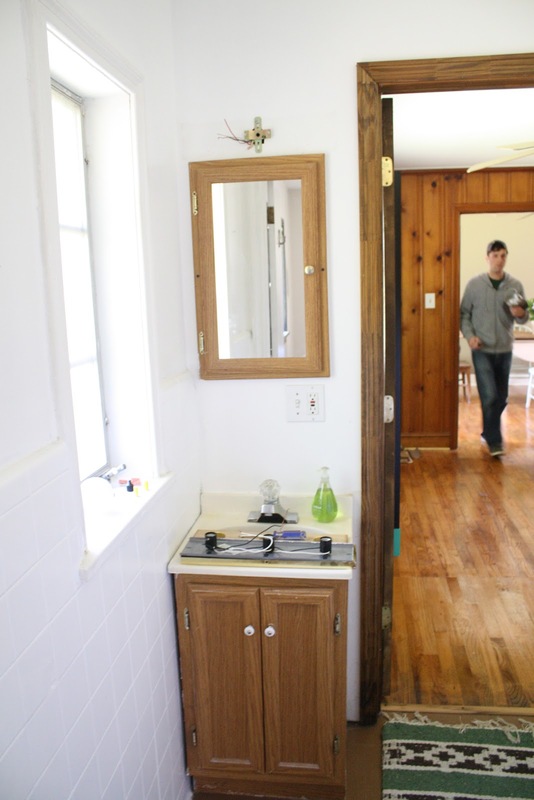 Do you see that weird little cabinet next to the window in the top photo? I used to hate it...now I love it. So entirely strange...but so entirely cool. That's what I love about this house...character. Anyhow, we have big plans for the kitchen. I want to work with what we have and the character of the space. But it's pretty much my dream. The laundry used to be on the other side of that wall, in a dingy, cobweb-filled room off the garage. No more, friends. Hubby and dad drilled through the wall for the hoses and the electrician installed a dryer hookup. This room is dreadful now, but it will be painted white and hubby is building me a butcher block top for the W/D to make it more of a built-in look. There's two huge windows on the opposite wall, and they will have a bench with storage underneath. I see it all being very simple and industrial in feel. Anyhow, welcome to our mudroom/laundry room that's just off the kitchen. trellises with vines spilling over, and a man hut. 'Nuf said. Which we're turning into our den. is that a faux pas? Can you even call it that if it 's maybe the smallest bathroom of all time? It's cute. And perfect for Maple. I've already painted the vanity and mirror. We're building some rustic shelves for a wall you can't see. Oh, and that horrible light fixture is gone. And the little shower is actually pretty cool. That high gloss black trim against dingy white walls is my worst nightmare. It's all been primed and is ready to be painted (this weekend) the perfect shade of gray. We installed a modern, white ceiling lamp and I'm building a headboard and installing linen roman shades on the windows. Can't wait. A cozy little space well-suited for our antique brass bed and friends and family staying over. It's a bright little space that's draped in sunshine most of the day. Or, what will be at least. Love the two huge windows and how bright and airy it is. Sadly it falls to the bottom of our priority list, but I guess there's always that one room. It's pretty decent how it is, though. 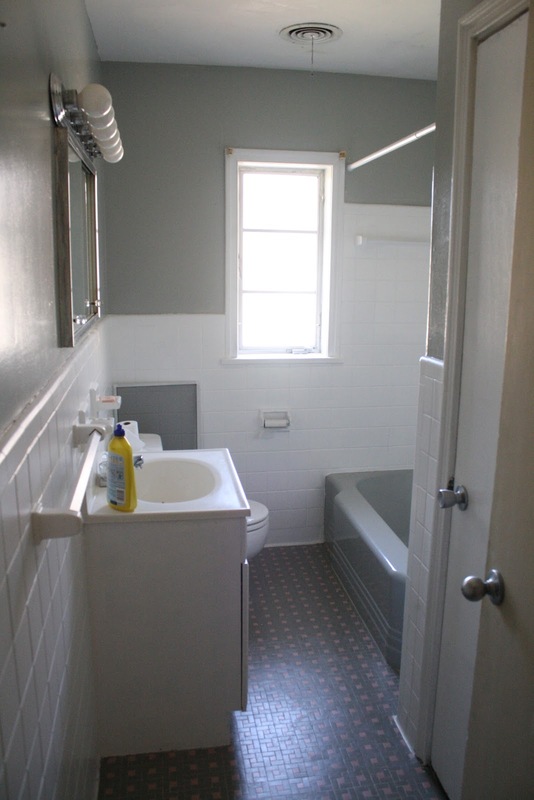 Oh...yes...complete with a pink and gray tile floor and a gray bathtub. Okay, I actually really love the tub. She needs some work, but all-in-all she's a pretty great space with lots of potential. Can't wait to show you the simple fixes I have up my sleeve! So there you have it, friends...our house: the project that's swallowing our time (and hopefully not our money). What do you think? Are we crazy? We think it's pretty wonderful, and perfectly well-suited for me and Maple...and our little pup. Maple and I have so many ideas for the space--most of them consisting of simple, inexpensive DIY projects. I hope you don't mind, but they're sure to be making an appearance on the blog. See you Monday (yes, really...I promise). hannah, it's so great! i LOVE the huge window in the kitchen. we have cedar paneling in our den that we painted a light stone gray and it made a WORLD of difference. really brightened up the space and made it feel larger. i can't wait to see everything you all do! and poppy looks like she's grown! ;) have fun this weekend. oh, and i second the young house love blog - so many great diy ideas! ps - the hubs, pup and i may be heading out to charleston this summer for our anniversary. we've never been, so i may need advice on some places to hit! oh, and i really like the tile and tub in your bathroom. totally something to work with! what year was your house built? Adrian--our house was built in 57! and oh my goodness, you would have the best time EVER in charleston. you MUST come! a photographer's dream :) send me an email--i'd love to give you recs! maybe we can grab coffee or a drink while you're here! i *love* it! you are completely right - it has great bones! i loved the tour and can't wait to see what you do with it. i will just have to live vicariously through you until i get out of the little apartment phase. i, like you were, am so very ready for a house and yard of my own! love the house!! what awesome potential! can't wait to see what you come up with! so exciting!! what area of charleston are you in? my brother & sister-in-law live on Daniel Island...we were in town last weekend for the cooper river bridge run :) i'll take any excuse to be in that city!!! SO much potential! can't wait to see what ya'll do with it! Love it girl! There is nothing like an older home that you can make your own. I live in a 1960s house and it reminds me a lot of yours! It's a lot of work but so fun and when a project in finishes it's SUCH a great feeling. You will be SO proud of your home when it's all said and done. I can't wait to see what you do with the place!! !